The Essex National Heritage Area offers a rich history of the African American experience, from the eighteenth century to the present. Some of this history has been written, but much of the material is either hidden, scattered, or misplaced. A thorough accounting of the collections and resources, organizations and individuals concerning African American history in Essex County, MA is imperative. Only after such an accounting is complete can the National Park Service (NPS) begin to synthesize this history and make use of it for developing interpretive and programmatic initiatives. 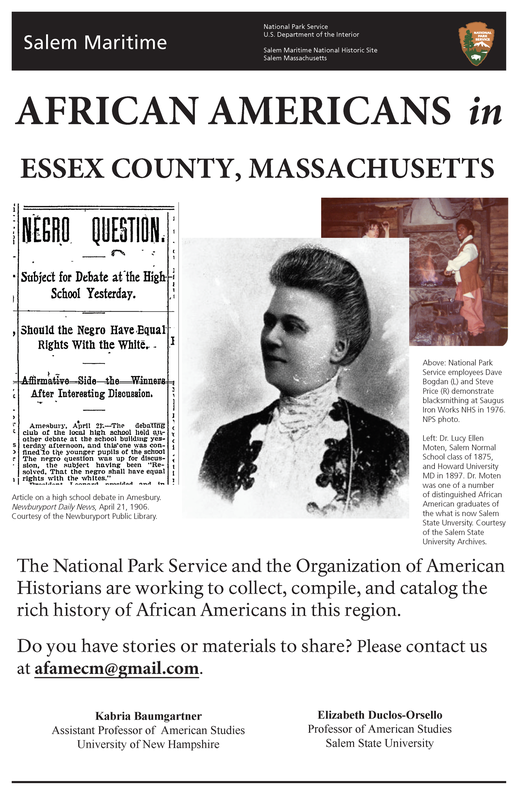 Thus the aim of this two-year public humanities project is to collect, compile, and catalog the rich history of African Americans in Essex County, MA. I am working with a co-PI – Dr. DuClos-Orsello at Salem State University. You can download and circulate the flyer below, if you wish.